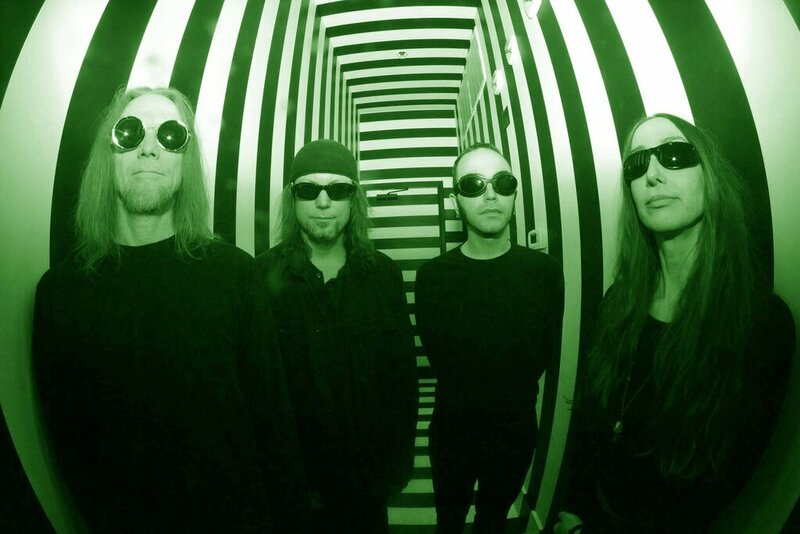 Eyeball is a collective of beings from Raleigh, North Carolina who combine their music with effects, noise, and feedback to venture beyond the astral realm of psychedelic neo-space rock. For starters, what bands were you guys a part of prior to EYEBALL? How long has the band been around? I am Trey, the group’s drummer and founder and I first met Myriam when her band PROSTITUTE HOSTAGE opened for my band VIVA la VENUS! some years ago, I always remembered her because she was so different. When I decided to form EYEBALL at the end of 2015 she was the first guitarist I contacted because I wanted someone that had their own sound, so many guitarist these days sound like each other to me, but she stood out. Our synth player Aaron originally played guitar in a metal band called JOHN DIES AT THE END and the bassist Brian is from the psychedelic gypsy soul-metal band called LACTOSE QUERVO which is still active. We tossed around a few names that never felt right and was looking for something easy to remember that gave a trippy kind of image and also looked good in print. It's worked so far although we found out that it isn't exactly the most "search engine" friendly band, anyone searching for us should put "eyeball band" in quotes unless they want a bunch of medical information and whatnot. We've all contributed to the music to some degree; we're really good about having discussions on what type of song we want before any music is brought in, the music's direction is planned out ahead of time for the most part. We make a strong effort not to repeat ourselves and in a 45 minute set we take the audience on a journey through many different genres and soundscapes, we've been told we take people to another world. I write the majority of the lyrics, I like to write in third-person because it’s challenging, plus the music world has enough "I", "you", and "me" songs as it is I think, topics are on psychology, space, fantasy, and things that provoke images of some sort. I'm open to whatever subjects that interest me at the time, there is no set rule. None in particular because we are striving to sound like our own band and not copy another. People tell us all the time that we might remind them of one band or another and they are rarely the same ones or even bands that we listen to, but some of the more common ones are PINK FLOYD, BLACK SABBATH and SONIC YOUTH for some reason, we never set out to sound like any of them though. Not really, it was mainly to try to play music different from the bands I was seeing around the scene. So many sounded like each other to me, lots of trend chasers and I was getting tired of seeing bands that stop after every song, seems they would just go down the list and demonstrate each song one at a time. Our set is one continuous piece of music from start to finish and even when we have a list of songs, they are all woven together with interconnecting segues and the music never stops. No, our guitarist warms up but that's about it. I will do some practice pad warm ups if I drum for other acts that have demanding music, but with EYEBALL that hasn't been an issue, I don't venture into "drumnastics" like when I'm playing with a metal band. Seeing our videos get released, nothing like getting feedback from the hard work we put in. Recording is always fun with this band too because we use the studio as an instrument by creating parts and sounds on the spot to go along with parts we bring in, this is a creative group so it’s always fun to see what happens when we put our heads together. We recently played top billing on the Triangle Psych Fest and the response was overwhelming, so many people came up to us and gave us the best feedback we've ever had and it went on for days afterwards with emails and Facebook messages, it was a real milestone gig for us. I don't know, there are so many, early PINK FLOYD, JANE'S ADDICTION, SIOUXSIE AND THE BANSHEES, PORTISHEAD, SONIC YOUTH, the list goes on, and that's just off the top of my head at the moment, others in the band would have a totally different list of bands. Just any that are more experimental and out of the mainstream so their audience would get what we do and have an open mind about hearing music like ours. Thanks for the interview and if anyone wants to experience some EYEBALL visit our website: www.eyeball-band.com for music, videos, and more - and grab a free download while you’re there. Enjoy. Newer:Paradise Lost Announce 30th Anniversary North American TourOlder:Acaedia Releases New Single, "Empty"